This illustration by Jayel Draco is pretty much how I look right now. PJs, wine, and hookah! 2011 is almost over and I must admit I’m not too sad to see it go. I had some great moments this year–filmed some hot scenes with some cool people. Spent lots of time at home with my robot friend. Made lots of new friends! And I mean actually made them… but I can’t really explain what that means. Because it’s a secret…. ANYWAY have a great New Year’s Eve, everyone! Be safe! Drink champagne! I’ve got a nice bottle on ice ready to go, a bottle of Lagavulin airing in the corner, and an already aired glass of cabernet in my hand. And a hookah smoldering. And some test samples in the centrifuge waiting for me! And other stuff. That I can’t talk about. ARGH. 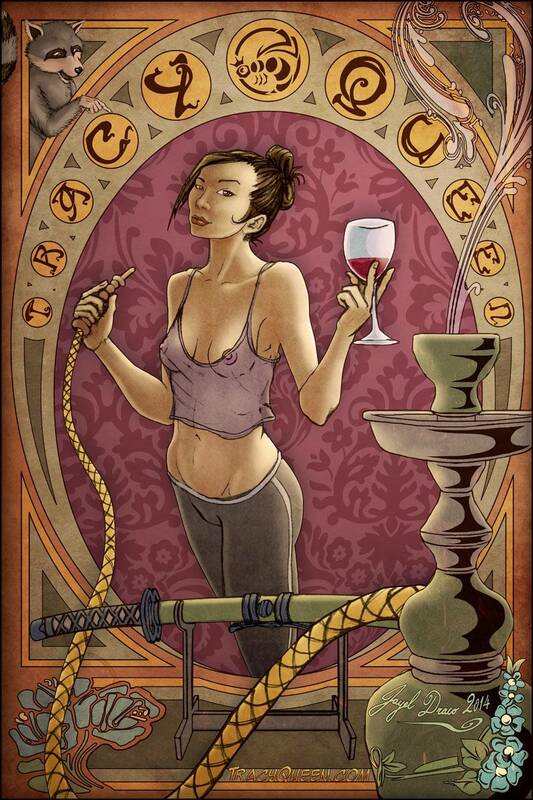 Ok, the point is, that illustration up there by Jayel Draco is pretty much how I’m spending New Year’s Eve. I’m going to send 2011 off with a buzzed bang and start 2012 with a hangover… Bring it on, 2012! See you beautiful people next year! Don’t forget to check out the rest of my website, TracyQueen.com, for more art and info and goodies! 1 Comment on Peace out, 2011!